We should welcome Bernie Sanders' presidential run, while being aware of its limits. “I am not a capitalist soldier. I am a proletarian revolutionist. . . . I am opposed to every war but one.” So said Senator Bernie Sanders in 1979, reciting a speech from five-time Socialist Party of America presidential candidate Eugene V. Debs for a Folkways Records collection. The language was out of place in a country about to enter the Reagan revolution, where even the modest accomplishments of the American welfare state would come under attack. 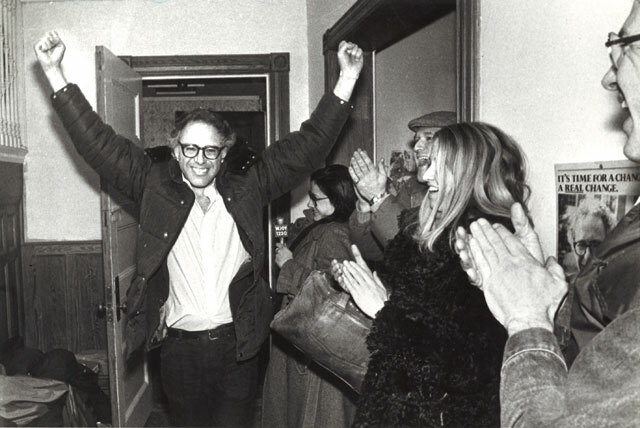 Yet two years later, Sanders became mayor of Vermont’s largest city. The Vermont Vanguard Press celebrated the “People’s Republic of Burlington” with a special issue. Sanders put up a portrait of Debs in his new office — a portrait that now hangs in his Capitol Hill office. Sanders is technically an independent who caucuses with the Democrats. And his own variant of socialism is more reminiscent of former Swedish Prime Minister Olof Palme, a fellow social democrat, than the Bolshevik-sympathizing Debs. Sanders likes to compare the accomplishments of the Scandinavian welfare state with the inequity of American society, highlighting our childhood poverty and lack of affordable health care. His solutions — progressive taxation and robust public services — are not too far out of step with those of his most liberal Senate colleagues, like Massachusetts Sen. Elizabeth Warren. Rank-and-file Democrats agree. For years they’ve prevented their party from splitting the vote and running candidates against him in Vermont — another sign that the socialist label no longer conjures images of breadlines and gulags. Sanders doesn’t offer the sweeping emancipatory vision or principled anti-imperialist politics that we should demand on the Left, but his full-throated defense of the welfare state stands in marked contrast to frontrunner Hillary Clinton’s business-friendly policies. And with Elizabeth Warren likely not contesting in 2016, only Sanders can push primary season to the left — forcing Clinton to make the kind of bold commitments to appease (and later alienate when they go unfulfilled) a disgruntled progressive base. Unlike most of Europe, the United States never developed a mass labor party that vied for power and built a generous welfare state. But for most of the twentieth century, many within the Democratic Party were able build the fragments of one within its tent. The constituencies that played this role — labor unions, civil rights organizations, and community groups — are still around. But because they lack structural control of a party that fundamentally represents the interests of capital, they are easily tossed aside. As the gap between them and the policies pursued by party leaders like Barack Obama becomes more evident, it’s no surprise they are starting to make their voices heard. Hillary Clinton is deeply rooted in the New Democrat tradition, and played a role in creating the set of policies that have become the party’s common sense. New Democrats rallied together under the auspices of the now defunct Democratic Leadership Council (DLC) in the late 1980s. Their platform was a direct response to the Reagan-era triumph of conservatism. With tax-and-spend liberalism appearing electorally unviable, Democrats were supposed to promote a leaner and less obtrusive government (even while tinkering with some progressive social policy at the margins). The Clintons’s role in transforming the Democratic Party at a national level throughout the 1990s (winning short-term electoral payoffs in the process) is undeniable. After all, it was President Clinton — not Ronald Reagan — who balanced the budget and ended “welfare as we know it.” And it was Hillary Clinton, then the first lady, who strongly supported landmark, DLC-backed achievements like the 1996 welfare reform bill. President Obama, despite his promises of change and 2008 primary battle with Clinton, hasn’t deviated from the DLC agenda. Yet most traditional liberals have opposed New Democratic policies, as well as Clinton’s inaction on climate change and aggressive foreign policy that included support for the Iraq War. In recent years, the political tides have continued to move against the Clintons, especially in the wake of the 2008 financial crisis. A politically engaged and active Tea Party movement on the Right has garnered more headlines, but the Occupy movement, labor insurgencies such as the Chicago Teachers Union strike, fast-food worker activity, movements against police violence, and increased attention to income inequality all point to the incipient reemergence of the American left. Electorally, an eclectic mix of personalities has vied to fill the space that grassroots action has opened up, from New York Mayor Bill de Blasio to Senate populists like Warren. But aside from Sanders, none of these figures are prepared to run in 2016. Sanders has described his potential run as an attempt to build organization and pressure from the left: “If I run, my job is to help bring together the kind of coalition that can win, that can transform politics.” It would be the most profound attempt to do so within the Democratic Party since the electric Jesse Jackson campaigns of the 1980s. Sanders can only dream of mustering the political forces that Jackson drew on, and the reasons why mainstream liberals want Clinton to win the primaries are easy to understand. Nationally, she’s the most well-known and popular Democratic figure in the race, and she can sustain the party’s popularity among women. Quite simply, she’s tough to beat, and a big victory in 2016 could pave the way for a Democratic Congress. But polling has indicated that just as Republicans lurch rightward, self-described Democrats are becoming more coherently and uniformly progressive. At the heart of the potential base for a Sanders campaign is the increasing divide between the centrist leadership of the Democratic Party and those voters who still cling to the vision of the Democrats as the party of the New Deal and Great Society. Perhaps as a response to renewed fervor on the Right, more Democrats say they’re for an activist government, capable of regulating business and providing social services. This group of liberals sees Obama’s few successes — health care reform, for instance — as insufficient wonkery at best, and wholesale corporate giveaways at worst. The absence of a vehicle like the Tea Party to give these sentiments political articulation opens a space for Sanders to solidify progressives into a coherent voting bloc. Meanwhile, as Politico has reported, Clinton is seen by some large liberal donors as too centrist to warrant support. Even those who don’t share Sanders’s social-democratic politics want her challenged from the left, and see Sanders as a potential wedge to drive the Democratic Party back from the center-right. Sanders is more likely to alter the tone and substance of the debate than someone like Dennis Kucinich, the Ohio congressman who served as the lone progressive voice in recent presidential primaries but never gained any measure of mass support. Sanders is also taken seriously by voters. He has the credibility, and the baggage, that comes from being a sitting senator, and he’s a forceful voice for wealth redistribution. In an era of economic stagnation, frustrations that were once muted can boil over into outright antipathy. There are enough people on the left of the Democratic coalition to create headaches for a Clinton campaign. Plans to move to the center to boost general election prospects as soon as possible will no doubt be derailed a bit by Sanders’s emergence. It clearly won’t be enough to win this time. But, seen as an opportunity for movement building, Sanders’s candidacy could strengthen the Left in the long run. The tensions among Democrats are serious and raise the possibility for the realignment of progressive forces on a totally different basis. This is a different project than the attempts of Michael Harrington (and others) to turn the Democrats into a more traditional social democratic party by pushing it leftward. Our goal must be to transcend the Democratic Party entirely. It’s far from a failsafe plan, but in this moment the best bet for the Left in the electoral arena is to support both independent political campaigns and insurgent primary runs by socialists and other radicals. Having Sanders openly defend socialism, and contest the New Democrat record before a national audience, is a step in the right direction. To be sure, there are dangers in a Sanders bid for president. Historically, attempts to grow social movements through outsider primary runs — like the 1980s Jackson campaigns — were dead-ends, and possibly even weakened independent political efforts. But Sanders’s candidacy doesn’t have to channel left forces into what will likely be a Clinton nomination. Instead, it could be a way for socialists to regroup, organize together, and articulate the kind of politics that speaks to the needs and aspirations of the vast majority of people. And it could begin to legitimate the word “socialist,” and spark a conversation around it, even if Sanders’s welfare-state socialism doesn’t go far enough. A vibrant Sanders campaign would be a sign that bleak job prospects and the squeezing of American workers are creating a political constituency for change. When he fails, there’s every reason to believe that radical voices can take his place, carrying the memory of Debs back into the political mainstream. We should welcome Bernie Sanders’ presidential run, while being aware of its limits.